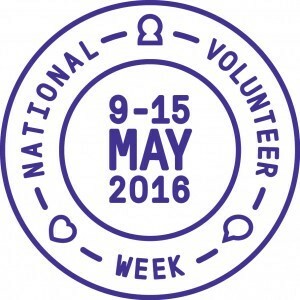 This week marks National Volunteer Week in Australia – time to celebrate all that volunteers achieve for our environment and community, and a chance also to think about getting started with volunteering if you haven’t taken the plunge yet or revisit volunteering again if ‘its been a while’! 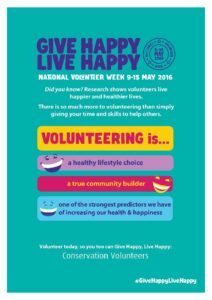 Research from Volunteering Australia shows that 95% of volunteers say that volunteering is related to feelings of wellbeing, and a staggering 96% of volunteers say that ‘it makes people happier’. According to the research, volunteers are happier, healthier and sleep better, than those who don’t volunteer – doctors should recommend it. So if you’d like to follow this year’s theme and Give Happy, Live Happy, check out the projects below, email info@cva.org.au or freecall 1800 032 501 – we’d love your help!